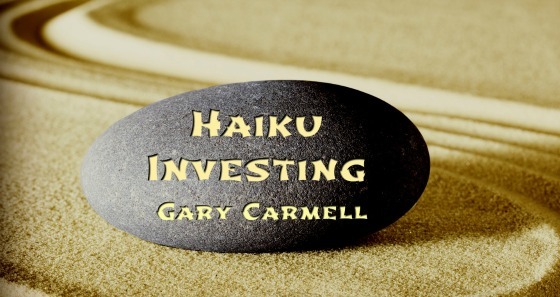 Since I will be a traveling man for the next few weeks, I thought I would tap into some of my right brain abilities, limited as they may be, and share some haiku investing with you for the next two weeks. Haikus are pretty fun to noodle around with because of the limits they impose on the creator of them. They have to be three lines in which the first one has five syllables, the second seven, and the third line five syllables. That’s it. No more, no less. They’re also known for bringing together images, concepts, ideas, and themes that don’t seemingly go together. While I stay fairly uniform in my investment haikus, I have found that finding connections between the seemingly unconnectable can generate keen insights from time to time. I hope you enjoy these and look forward to any feedback you may have. Well? Did you enjoy my Haiku Investing? I like your Haiku Investing! When you say “Debt magnifies returns,” are you referring to all debt, minimum debt or variable rate debt? I think I know what your meaning is but thought I’d ask for clarification.